Callum Smith on the ball for Westfield against Worthing Town Leisure. 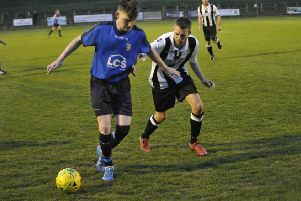 Westfield's footballers snatched victory from the jaws of defeat in a dramatic finish at The Parish Field on Saturday. The Westies netted in the 86th and 93rd minutes to turn a 1-0 deficit into a 2-1 win at home to Worthing Town Leisure in Macron Store Southern Combination Football League Division Two. Sam Ellis tussles with a Worthing Town Leisure opponent. Westfield made the bulk of the running during a scoreless first half and will feel they ought to have been ahead at the break. Callum Smith's left-foot shot on the turn went just wide and moments later Sam Ellis was denied by the goalkeeper's legs following a lovely ball by Ryan Quinn. Smith headed just wide after Jake Adams nodded a free kick across the box, Ellis headed straight at the goalkeeper from Quinn's cross and an overhead kick by Adams following an Ellis corner narrowly missed the target. An Ellis shot was pushed away by the goalkeeper low to his right at the start of a second period played in near continuous rain, but Westfield then lost their way and Worthing began to get on top. Ryan Quinn turns away from his marker. Westfield had a big let-off when Worthing hit the top of the crossbar with a penalty awarded for a push by Joe Dicken, but the visitors took a 76th minute lead as Stephen Kirkham glanced home a low cross from the left. Falling behind seemed to get Westfield going again. Smith shot just wide of the far post and the away goalkeeper made a fine save from Martyn Durrant before Asher Grindle equalised with a delightful lofted finish from the left-hand side of the box into the far corner. Worthing's goalkeeper produced a super save to prevent an own goal and Smith pulled his shot whiskers wide having been put through by Liam Ward. Harry Stapley splendidly tipped over Kirkham's 25-yard drive at the other end. Westfield grabbed a winner in the nick of time. Ellis put Smith through again and this time the striker slotted past the goalkeeper for his 12th goal of the season. Lewis McGuigan on the ball. Westfield: Stapley, McGuigan, Quinn (Durrant 69), Ward, Dicken, Dadswell, Winter, Adams, Smith (Harris 90+4), Ellis, Carey (Grindle 69).